Today a growing number of homeowners are investing in radiant heat to warm their homes. Indoors or outdoors, radiant heat is an efficient, environmentally friendly, versatile solution for your home heating and snow melting needs. Warmzone radiant heat systems are designed to deliver consistent, evenly spread heat throughout your home, according to your specific preferences. Radiant heat generates a feeling comparable to the warm, enveloping heat you would experience sitting on warm sand at the beach. That’s because these systems depend largely on heat transfer from one object to another. The science behind radiant heat systems effectively eliminates the draftiness and heat loss associated with traditional forced air, making them much more comfortable and much more efficient. A switch from forced air to radiant heat can also improve the air quality of your home, which is especially important if you suffer from hay fever or equally unforgiving allergic conditions. Forced air systems force, or blow air into your living space, along with dirt, dust and allergens that can compromise your environment. With radiant heat, there’s no duct cleaning or dust to contend with. They’re also very green systems. Inside, radiant heat can be programmed to heat your entire home, or timed to heat specific areas as you move from your kitchen, to your living room and then bedroom to retire, conserving energy for pennies on the dollar. This same science works wonders outside to keep snow and ice away from your home. An outdoor radiant heat system (snow melting system) involves the laying of pipes or electric cable just below the surface of a driveway or walkway. Their flexibility makes them effective under brick pavers, concrete or asphalt pours and are easily configured to accommodate odd-shaped or hard-to-reach areas. 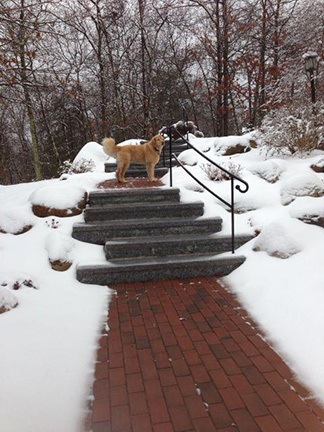 Warmzone sensor-activated radiant heat systems are designed to anticipate snowy conditions to heat walkways, driveways and other areas without resorting to harsh snow melting chemicals; chemicals that can kill vegetation, irritate puppy paws and contaminate ground water. They also eliminate the pain of shoveling and, over time, the expense of snow removal services. Fortunately, whatever your needs are, Warmzone takes a top-down approach to radiant heat system delivery, and it begins with a phone call. When you call Warmzone, you can to talk to radiant heat professionals with years of experience, free of charge to discuss your radiant heat needs. Based on your input, we can determine what system is right for you. Warmzone offers a vast selection of products and years of industry experience. We can put together the perfect radiant heat system to meet your needs and your budget. And if you are a die-hard do-it-yourselfer, you’ll appreciate not only access to the pros, but our vast library of materials, including articles and schematics to help you along the way. For more information you can reach our radiant heat professionals at 1-888-488-9276.